Earth Day, Saturday, April 22, is one day when most folks pay particularly close attention to protecting the environment. This year, we're finding inspiration in a group that was working to maintain the planet before doing so became a thing. We're told that the Sisters of Saint Francis got "into the recycling craze before it was cool" as a way to help raise money for the Poverello Fund, a fund established by the late Sister Generose Gervais to "help patients of Saint Marys Hospital cope with medical expenses." The Sisters' early efforts to "go green" began, we're told, around 1968. Sister Vera Klinkhammer noticed that "thousands of aluminum cans" were taken from the hospital to a local landfill each week. "She thought there surely had to be some way to turn all of those cans into cash to help more patients," John Murphy, Public Affairs, tells us. So Sister Vera sought out a local broker who was willing to exchange the cans for some greenbacks. "There were two important catches," Murphy says. "First, the cans had to be gathered. And second, their size had to be reduced so they could be more easily transported and weighed." That didn't slow Sister Vera. She enlisted the help of her sister and fellow Franciscan Sister Gildas Klinkhammer, as well as Sister Alice Marie. "Each night, they'd visit vending areas and other 'hot spots' around Saint Marys to gather as many cans as they could," Murphy says. Then they'd take their loot (our words) to a basement area near the Saint Marys chapel. And that's where the real fun would begin. "Each night for a few hours, Sister Vera would put on her 'dancing shoes,' turn up some 'jazzy' music, and dance on the cans," Murphy tells us. "One by one, she'd stomp the cans flat like a grape stomper making wine." Today, Mayo's recycling efforts are a bit more conventional. 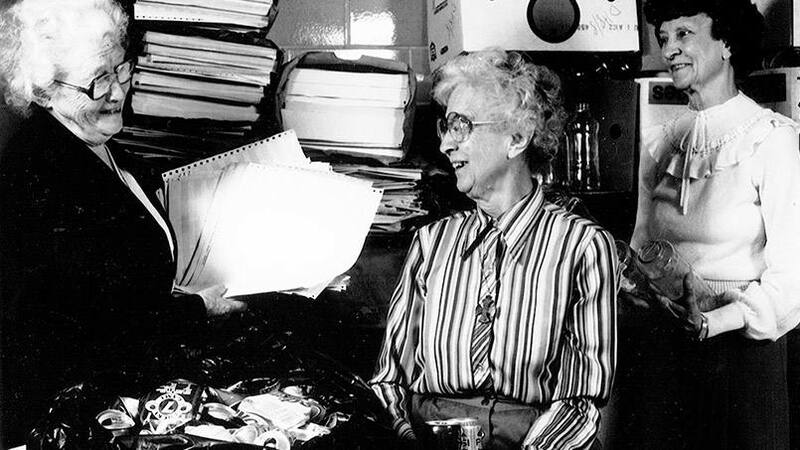 Perhaps taking a cue from the Sisters, during the summer of 1990, Mayo Clinic dedicated 2,500 square feet of space to repurposing the institution's mounting recyclable materials. Things have only grown from there. "Each year, we recycle more and more materials," Amanda Holloway, section head of Mayo Clinic's Divisions of Environmental Services and Waste Management, tells us. "We started with paper in 1990, and a few years later, we started recycling electronics," she says. "We've added things like fluorescent lightbulbs, beverage containers, Styrofoam, metals, batteries, and toner cartridges." Glen Goodsell, who leads the team overseeing Mayo's now 25,000-square-foot recycling facility, says the amount of recycling needs to be seen to be believed. "We're averaging between 10 million and 11 million pounds of recyclable material each year," Goodsell tells us. And it's not just the usual suspects that are recycled. "You wouldn't believe how much metal, iron and tin we also recycle each month from Mayo's construction projects and employee office relocations. It's quite incredible." What's even more incredible is that the recycling program still honors the Sisters' original desire. "Half of all of the revenue we get back from all of our metals goes right back to the Poverello Fund to help our patients," Goodsell says. No comment goes to waste. Leave your comments below before you use the handy social media tools atop this page to share this story with others.